Watch full One Piece Season 15 Episode 19 English Dubbed full HD online. One Piece Episode 535 English Dubbed online for free in HD. Hordy’s Onslaught! The Retaliatory Plan Set Into Motion! 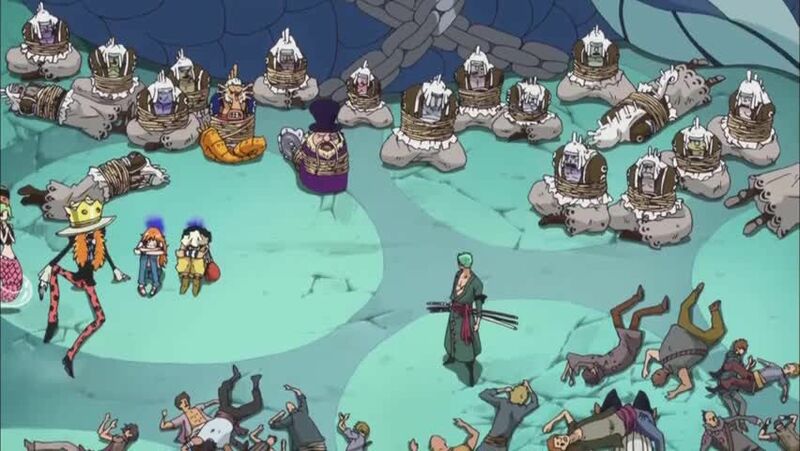 On Coral Hill, Hordy remarks that this will be the last day of the Ryugu Kingdom as the fishmen are here to drive the humans out of the island. Meanwhile, Robin dispatches a group of armed guards at a bus stop before fleeing to find the ancient Poneglyph connected to the true history. At the Ryugu Palace, Neptune reveals that Shirahoshi used Megalo to hide inside and Nami tells Neptune that they will never kidnap a princess. However Neptune cannot return the Thousand Sunny and the rest of the crew to her if she does not return safely. At the Sea Forest, Franky and Den discover the Thousand Sunny and Den reveals that he has been researching the forest. Meanwhile, Hordy and Decken finally arrive at the palace. When Decken uproots a coral and sends it off to find Shirahoshi, Decken threatens to kill the princess if she becomes another person’s wife. 4.8 / 5 - 35 ratings.